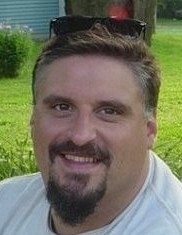 Peter J. Barthelmes (Mr. Pete), 50, of Waterford, passed away at Millcreek Community Hospital on September 26, 2018 following a lengthy illness. He was born on August 9, 1968 in Erie, PA. Peter graduated from Fairview High School and went on to Edinboro University and obtained an Associate Degree in Social Work. Peter worked for 20 years with at-risk youth as a child development specialist in Erie County. The children "Mr. Pete" worked with held a special place in his heart. Peter played in the band the Acoustic Refugees and his favorite gig, because he could take his kids, was playing for The Golden Gloves fundraiser each year. Peter loved camping and always kept the fire going with music, jokes and endless conversation. He will be remembered by his children for his love of music, Jeopardy, The Simpsons, the Raiders and his undeniable love for their mom, Paula. Peter married Paula Rene Anderson on May 16, 1998. He was preceded in death by his father, Terry F. Barthelmes, who passed just two short weeks prior to Peter's death. He is further preceded by his Golden "Reteaser" Abby. In addition to his wife, Peter is survived by mother, Lita Lander Barthelmes; brother Scott (Linda) Barthelmes Pittsburgh, PA; sister Lori Barthelmes Yukon, OK; children, David (Brittany) Anderson of Erie, Jesse (Shaddow Walters) Anderson of Wattsburg, Tori (Alex) Cochrane of Fort Drum NY; granddaughters, his pride and joy, Leyla, Lauralie, and Lainey. Peter's pup, Shelby, and kitty, Sylvia, never left his side. Special thank you to Dr. Brian Viviano, Dr. Eric Milie and Dr. AJ Farris for never letting Peter give up hope. A Celebration of Life Memorial Service will be held at St. John's Lutheran Church, 2216 Peach Street, Saturday, October 6, 2018 at 3:30 p.m. with the Rev. Erik Young officiating. Memorial contributions may be designated to the family through the Scott Funeral Home, 2104 Myrtle Street, Erie, PA 16502.